Hume Dam forms Hume Reservoir (also known as Lake Hume), which is the main supply storage and one of the two major headwater storages for the River Murray system. The reservoir is made up of a concrete gravity dam and a series of earth embankments that impound the River Murray and the lower Mitta Mitta River. It is located about 10 km east of Albury and around 300 km downstream from where the Murray rises on the Great Dividing Range. The dam location means that flows from the upper Murray, Mitta Mitta (Dartmouth Reservoir is upstream of Hume on the Mitta Mitta River) and some water from the Snowy Scheme are regulated through Hume Reservoir. The primary role of Hume Reservoir is to regulate and conserve water for both human consumption and the environment. Secondary roles include hydroelectric power generation and flood mitigation. Hume Reservoir has also become an important recreation and tourist location. Following a number of years of drought during the second half of the 1890s, culminating in a record dry year in 1902, the community saw the need for a water storage to collect the high flows of winter and spring for release in drier months. This would provide a reliable year-round supply of water particularly during the critical months of February to April and would assist the expansion of irrigation and settlement along the Murray. A conference was held at Corowa in April 1902 to discuss the establishment of an irrigation scheme for the southern Riverina and northern Victoria. In the same year, an Interstate Royal Commission on the River Murray recommended the construction of a storage on the Upper Murray at Cumberoona, upstream of the present dam site. Between 1903 and 1913, New South Wales, Victoria and South Australia attempted to arrive at a workable agreement on the regulation and sharing of River Murray waters. Finally in November 1915, the River Murray Water Agreement was ratified by Acts of Parliament and was passed simultaneously by the Commonwealth and the three states. Hume Dam took 17 years to construct from the turning of the first sod on 28 November 1919 by Sir Ronald Munro-Ferguson, Governor-General of Australia. The first filling was in December 1934 and it was officially opened on 21 November 1936. Hume Dam was constructed for the River Murray Commission by the New South Wales Department of Public Works and the State Rivers and Water Supply Commission of Victoria, as joint constructing authorities. At the time, the capacity of the completed reservoir was 1,522 GL (at a Full Supply Level of 182.9 m above sea level). At about 16,000 km², the catchment area upstream of Hume Reservoir covers only 1.5% of the Basin. Whilst this is a relatively small area, the landscape of rugged ranges and valleys includes some of the wettest parts of the Basin. The catchment encompasses a considerable portion of the Australian Alps where total annual precipitation can exceed 2,000 mm. As a result, about 30% of the total inflow to the River Murray is sourced upstream of Hume Reservoir (including the Mitta Mitta River inflows downstream of Dartmouth but excluding the Snowy Scheme). Rain is the most common form of precipitation over the catchment, however snow is also important above 1,400 m. While only 7% of the Hume Reservoir catchment lies above this altitude, it is a valuable area that yields 18% of the water to Hume Reservoir — although only a small amount is from snow. This is 6.6% of the total inflow to the River Murray. Like the Basin more broadly, weather and hydrological conditions in the Hume catchment show considerable variability. Without this variability, there would be a much more reliable and consistent natural flow in the River Murray. On average, about 80% of the volume of water flow takes place during the winter-spring period, with conditions during the summer and autumn normally much drier. There can be considerable rain and stream flow variation from year to year and even between successions of years. This results in (often prolonged) periods of drought and flood that typify the southern Basin environment. average annual inflow December to May: 540 GL. These annual averages give some indication of the range of flow variability that is characteristic of the Hume catchment. However, from year to year, variability can be a lot more significant. The lowest recorded annual inflow was in the 2006–07 water year when just 120 GL flowed into the dam. The highest recorded annual inflow was 7,130 GL in 1956–57. Climatic conditions in future years are becoming even less certain, with the impact of climate change on rainfall patterns, the intensity of droughts and the size and timing of floods in the Hume catchment difficult to predict. 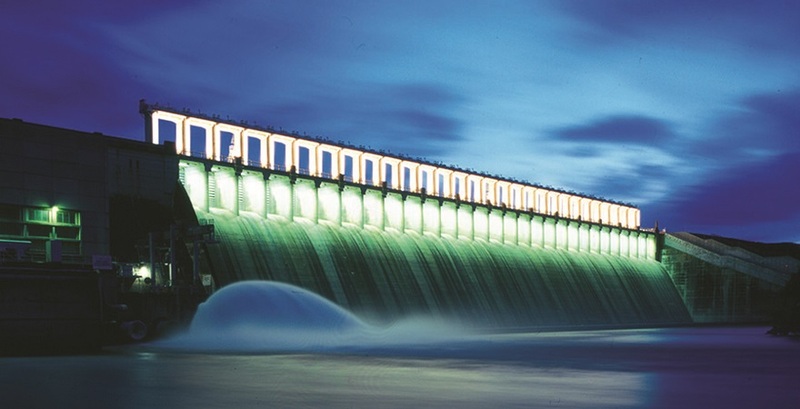 The Hume Reservoir is the main operating storage of the River Murray system. Releases from the reservoir in conjunction with downstream tributary flows, supply water along the Murray to New South Wales, Victoria and South Australia for irrigation, stock and domestic and urban consumption as well as for environmental purposes. The storage also re-regulates releases from the Snowy Mountains Hydroelectric Scheme to better match downstream demand. Releases from Hume Reservoir supplement water supplies to South Australia from Lake Victoria and Menindee Lakes. When the storage in Lake Victoria and Menindee Lakes is low, additional releases are made specifically for South Australian requirements. In turn, Hume Reservoir can be supplemented in times of drought with water released from Dartmouth Reservoir. Although generally more common at specific times of year, the dam's cycle and operational phases are not regular in their timing and duration. There is often considerable variation from year to year which reflects the extreme range of rain and hydrological conditions that affect the system. In recent years, there have been extended periods with very little inflow during the 'usual' fill phase; while spill phase operations — including floods — have taken place during unusually wet periods in summer. During the fill phase, most inflows are stored to replenish the storage volume. Filling generally takes place during winter and spring when downstream demands are at their lowest and upstream inflows increase. Releases are reduced to the minimum flow that can supply the in-channel and other environmental needs of the river downstream. In recent years, this approach has started to change. To restore a more natural flow regime that benefits the environment, slightly higher releases are now being made during winter-spring in a pattern that mimics the observed inflows. These releases are being undertaken using environmental entitlements and have led to a shift in the seasonal pattern of demand that has been in place since river regulation began. On average, Hume Reservoir spills about 1 year in 2. However, during the drought of the early 2000s, after filling in October 2000, the reservoir did not re-fill again until October 2010. During years when it is nearly full and the likelihood of spilling increases, operations move into the spill phase when managing 'airspace' is a focus and floods may occur. Airspace is the difference between the actual volume of water in storage and the volume when full. The amount of airspace that is held in storage takes account of the catchment conditions, rainfall and inflow forecasts, and the likely demand for water during the weeks and months ahead. Typically, larger amounts of airspace are maintained leading into winter when adequate rainfall is likely to re-fill the storage. However, as Hume Reservoir's primary function is water security, the storage is always operated to ensure it is filled prior to the commencement of irrigation releases. This means that in wetter years there will always be a period where the reservoir's water level is very high or full. The size of a spill — and the subsequent need to manage floods — will depend on the amount of rain and inflow that occurs during the period when the water level in the reservoir is very high or full. Actual downstream flooding takes place if enough water flows into the reservoir during the period of high storage levels and passes over the spillway. The supply phase begins when demand-driven releases of water exceed the inflows. This typically starts sometime between August and November, and continues until May in the following year. As a result, the storage is usually drawn down to between 10% and 50% of its capacity by the end of autumn. The planning and timing of releases for water supply is complicated by the fact that travel times for water from Hume Reservoir to locations downstream ranges between several days and several weeks. As such, demands must be anticipated well in advance. The range of fluctuations in weather conditions are considered to ensure the right amount of water is available at the required time, to meet flow and consumptive demands from just downstream of the dam through to South Australia. Providing sufficient water, whilst operating efficiently is one of the primary challenges of operations. It relies upon on-going investigation of modelled scenarios to understand risks to water access and target levels associated with if conditions vary between very wet to very dry in the weeks and months ahead. Hume and Dartmouth are operated in a coordinated (or ‘harmony') way, with releases being made from Dartmouth to share the available airspace between the 2 storages. This maximises the amount of water available for downstream use and also helps to mitigate floods downstream of the dams. The Hume's operating approach coupled with seasonal demands for water has almost inverted the downstream natural flow pattern of the Murray, with reduced winter and early spring flows and increased summer flows. a short earth embankment with a central concrete core wall on the northern (NSW) end. When the dam was constructed, seven regulating outlet valves were included — four 2.74 m in diameter, and three 5.18 m in diameter. The larger outlets were planned for eventual use as hydro-electric penstocks. Modifications between 1950 and 1961 enlarged the storage by adding 29 spillway gates on the gravity concrete structure, a parapet wall across the main embankment and 2 extra earthen embankments to prevent water flowing out through low 'saddles' on the Victorian side. To accommodate the increased loads resulting from raising the full supply level, tensioning cables were placed through the concrete gravity dam spillway structure to anchor it to the bedrock beneath. Other work included the installation of drainage holes beneath the concrete spillway structure to help control uplift pressures — engineering practice at the time the dam was built made no provision for uplift pressures. A 50 MW hydro-electric power station came into service in 1957. The two hydro-electric units were each upgraded from 25 MW to 29 MW in 2000. In 1983, the foundation drainage system was augmented to further relieve uplift water pressures under the concrete spillway structure. This was followed by works to overhaul the 50-year-old dam in 1985 to meet modern design standards; allowing for uplift pressures, revised design flood conditions and earthquake loading. In 1995, the then MDBC started a further program of improvements to update the dam to meet increasingly stringent international standards. The following year, monitoring processes detected an unacceptable amount of movement where the southern embankment connects to the concrete spillway structure. Immediate steps were taken to improve safety by lowering the water level in the reservoir by 5 m. The initial phase of those remedial works were completed in November 1997, when normal operation of the dam resumed. That program of remedial works was completed in 2003. Work is also progressing in relation to the capacity of the dam to manage extreme floods.